5★ rating average returns an average rating based on any 5-option voting. 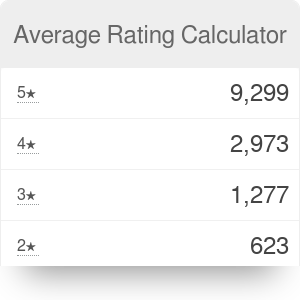 The average rating calculator takes a number of votes for each option (1 star, 2 stars, 3 stars, 4 stars, 5 stars) and gives you the mean rating. This is a case of a weighted average with 5 consecutive numbers and the number of votes as their weights. An example non-typical usage scenario for our 5 star rating calculator would be when you have a certain number of 1-4 ratings and you want to find out how many new 5-star votes you need in order to achieve a certain mean rating. You may also be interested in our average calculator. Average Rating Calculator can be embedded on your website to enrich the content you wrote and make it easier for your visitors to understand your message.